Habitat: It grows dispersed on gravelly soils in the highland slopes in grasslands, chaparral, pinyon-juniper, and oak woodlands vegetation, sometimes with the typical form. Agave couesii Engelm. in Trel. Trans. Acad. Sci. St. Louis iii. (1875) 311. Agave marcusea hort. ex Trel. Agave marensii hort. ex Trel. Agave parayi hort. ex Trel. Agave parreyi hort. ex Trel. Agave payrii hort. ex Trel. Agave neomexicana Wooton & Standl. Agaves Cont. N. Amer. 543 1982. 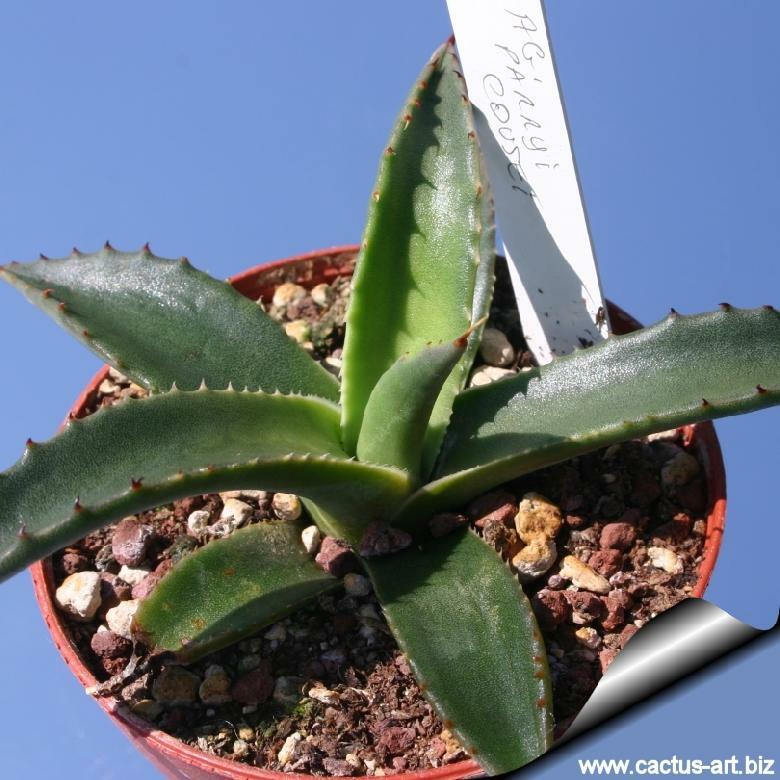 Description: Agave parryi var. couesii is one of the smaller and most attractive, hardy agaves. This plant suckers freely to form large clumps of flat-topped rosettes. It distinguish from the standard Agave parry for the smaller, narrower, more gradually pointed leaves and smaller flowers. This taxon represents a variant of smaller growth, however small leaved forms of Agave parryi, occur at random elsewhere. In a single population you can find all forms of plants with different number, shape, colour and size of leaves. It can happen that two individuals of two different populations can look very similar and also, two plants of the same population can look very different. Rosettes: 35-55 tall and 40-65 cm in diameter less closely imbricate than in Agave parryi. inflorescence: At the end of its life cycle a stunning flower spike emerges, with red buds opening to reveal bright yellow flowers. The mother plant dies, but the pups (offsets) continue to grow and replace the old rosette. Flowers: 25-55 mm long (vs. 55-75 mm long in standard Agave parryi); Ovary 20-34 mm long; Tepals tip more densely papillate than in Agave parryi, tube 6-9 mm long. Blooming season: Late spring-early summer. Chromosome number: 2n = 120. Note: The taxon hybridizes with Agave chrysantha. Agave parryi is widespread over a vast territory giving rise to a corresponding amount of variability. This variability has been recognized by botanists and the current thinking by agave taxonomists is that Agave parryi consists of two subspecies: Agave parryi ssp. neomexicana and A. parryi ssp. parryi. The ssp. parryi is further divided into four varieties; the nominate form, var. couesii, var. huachucensis and var. truncata. The distinctions between the varieties are somewhat ambiguous and, although the varieties are weakly differentiated, it appears that there is some geographic separation between them. Agave parryi Engelm. : (subsp. parryi var. parryi) Rosettes globose compactly imbricate, leaves broadly oblong, one-third to two-fifths as wide as long, 10 to 15 cm broad, 30 to 40 cm long, scape 4–6 m tall; perianth tube 6–12 mm, limb lobes 4–6(–7) mm wide; capsules 35-50 mm broad. Distribution: Central and southeastern Arizona. Agave parryi var. couesii (Engelm. ex Trel.) Kearney & Peebles: it is a somewhat smaller plant with leaves less closely imbricate and smaller flowers 25 to 50 mm long. Distribution: Yavapai and Gila Counties from the north-western border of the species' range. Agave parryi var. huachucensis (Baker) Little in L.D.Benson: is more robust, the leaves larger up to 35 cm wide and up to 65 cm long, and the panicle broader with larger flowers up to 75 mm long. Distribution: endemic of the Huachuca Mountains. Agave parryi subs. neomexicana (Wooton & Standl.) B.Ullrich: has leaves that "tend to be some-what more narrow, rosettes flat-topped, scape shorter, 3–4,5 m tall with fewer branches. Distribution: New mexico. Agave parryi var. truncata Gentry: it is distinguished by its very small leaves with acute to truncate apex, shorter marginal spines and doesn't sucker much if at all. Agave parryi cv. Ruby: The leaves in full sun take a nice purple tinge (hence the name). Cultivation and Propagation: They are usually cultivated outdoors in rock gardens, in cactus and succulent gardens, in Mediterranean-style landscapes, in borders, or as a specimen. It is very frost hardy! Soil: They do best in very well-drained, sandy or gravely soil. As an ornamental it is also grown in containers where it stays smaller than its outdoor brethren. In pots they need a very porous mix soil (e.g. 2 parts peat moss to 1 part loam to 1 part of pumice). Fertilization: They grows quickly if kept well nourished with a slow release fertilizer specifically formulated for cactus and succulents applied once or twice a year (poor in nitrogen), including all micro nutrients and trace elements. Hardiness: The variety couesii is one of the most cold hardy of the agaves, (hardy to -18°C USDA: 9b-11), However this variety has proven to grown without particular damages in wet, cold and harsh winters with temperatures down to -29°C, and is probably hardy to USDA Zone 8a (at least with good drainage). Scenography: These striking plants are wonderful when used for accent or simply to provide some all year round foliage and often used in a pot as a patio plant, can be moved around to change the scenery or position to give more shelter. Warning: It is armed with needle-sharp spines. Propagation: Seeds or suckers which often are found growing around the base of the plant, Remove the basal suckers (if available) in spring or summer and let the cuttings dry for a few days before inserting in compost.